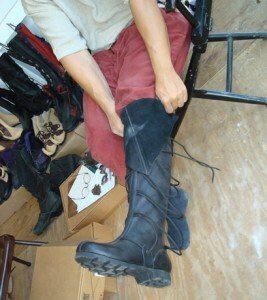 The peasant boots and the high boots are designed with a unique lacing system that is intended to allow our patrons a variety of fittings in a single boots. The all leather uppers are made of a think and soft bull hide. The leather being soft is intended to maximize comfort, while the thickness ensures durability. The support for the foot comes directly from the lacing, so proper lacing is essential. If you remove your lacings for cleaning or want to change them out to another color, they are easy enough to put back in when following this guide. 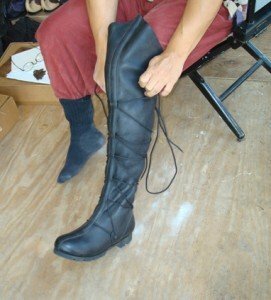 The center of the lace goes through the tab across the top of the foot (instep) then through the grommets at each side before going back to the center tab at the lower shin. This forms the beginning triangle. 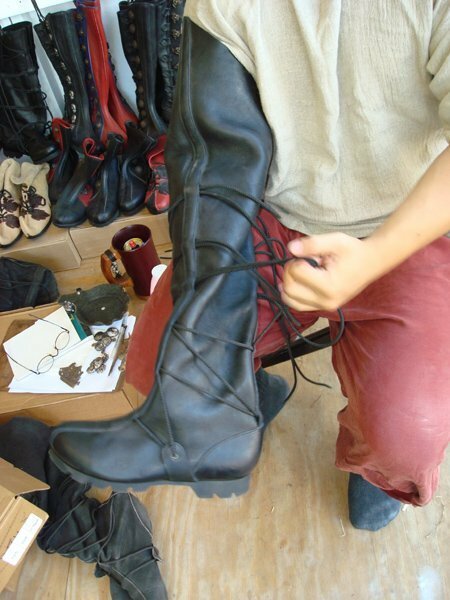 The laces are then wrapped around the boot in a corkscrew spiral, one side at a time. The lace ends in the back tab at the top, right at the back of the knee. 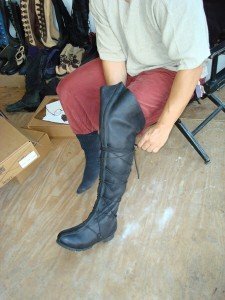 Loosen the laces on the boot by placing your hand inside the boot and pulling on the laces so that there is sufficient slack throughout the length of the boot. We give you a lot of slack in the laces specifically for that purpose, use it. 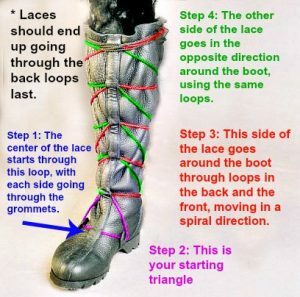 If you unlace the boots properly and loosen the laces fully around the leg this should already be done. If you pull out the lace from the loop during the process be sure to rethread it. Place some magical Pixie Dust* (baby powder) in the boot to ease getting them on. 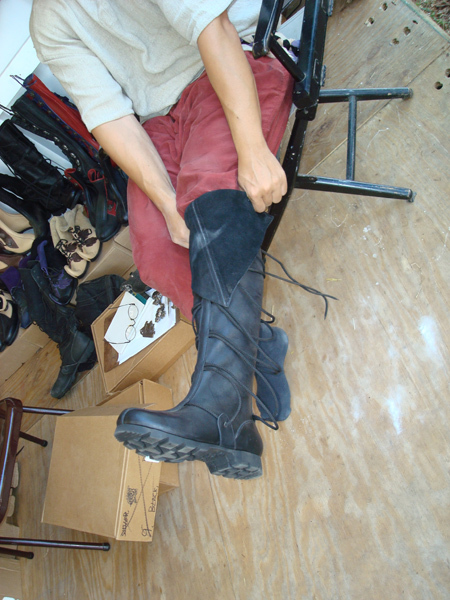 The boots are not lined to assure that the leather breathes well and you stay comfortable. Pull the boot on, like a long sock or a cowboy boot. 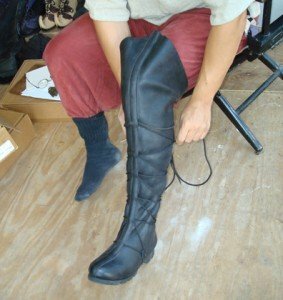 The leather on the boots is very soft and if you try to step into the boots you will simply be stepping on the leather over the heel cup. 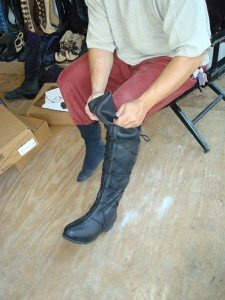 Pull the boot on stretching the back portion of the boot (over the heel) so that your foot slides into the boot and not onto the leather. Point your foot forward and wiggle it back and you should feel your foot slide into the boot. Once the boot is on, stomp your foot on the floor to loosen up the sock – if it tightens up. Start at the bottom and work your way up. 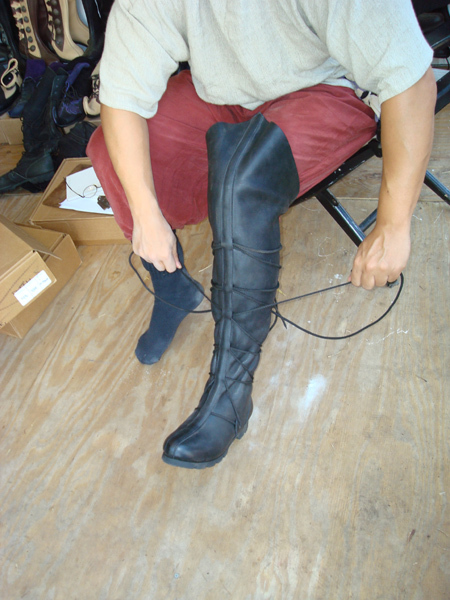 Adjust the lace making the boot snug near the arches. The tabs on the side will tighten up. Pull the lace around the ankle. Adjust the laces following the pattern of the lace they will start to form a Z shape. Adjust the lace pulling back on the front loop and forwards on the back loops. 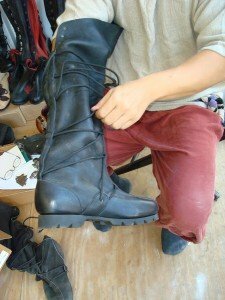 (Pulling up will not put the right tension on the boots.). Keep following the pattern until you reach the top of the boot. Once at the top, wrap the slack around your calf and tie a regular bow knot. When unlacing, be sure to go one level at a time getting the slack down from the top of the boot down into the ankle area. 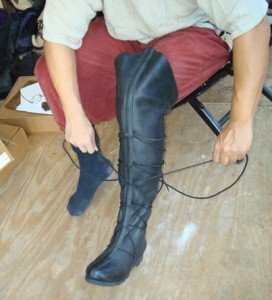 Slide the leather down off the calf and pull the boot off your foot.